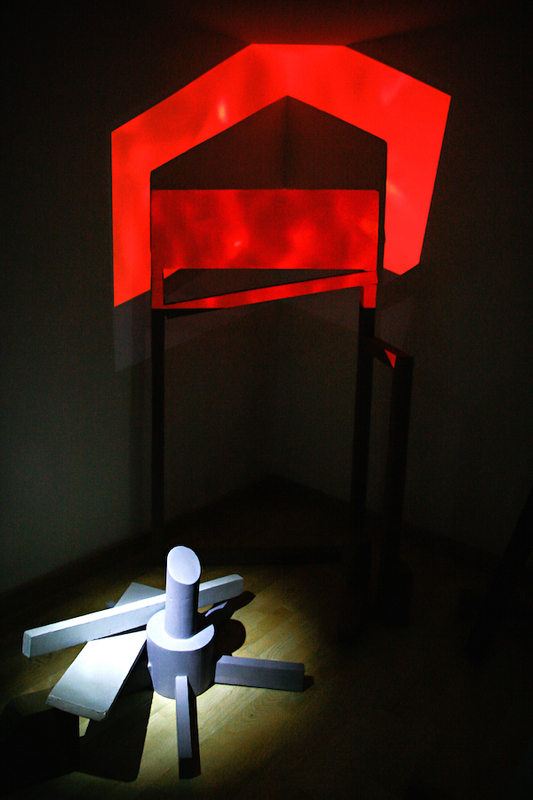 The exhibition of Máté Feles in Trapéz Gallery is based on the levitation scene of Andrei Tarkovsky’s cult movie, Solaris. The scene takes place in the library room of the space base floating over the planet Solaris. The simple space has a classic design with books, art and old, personal objects. This space recalls the Wunderkrammer, which is considered to be the predecessor of museums, where various unusual and valuable objects from the field of arts, antiques, natural science or the personal interest of the collector himself got place in an encyclopaedic order. 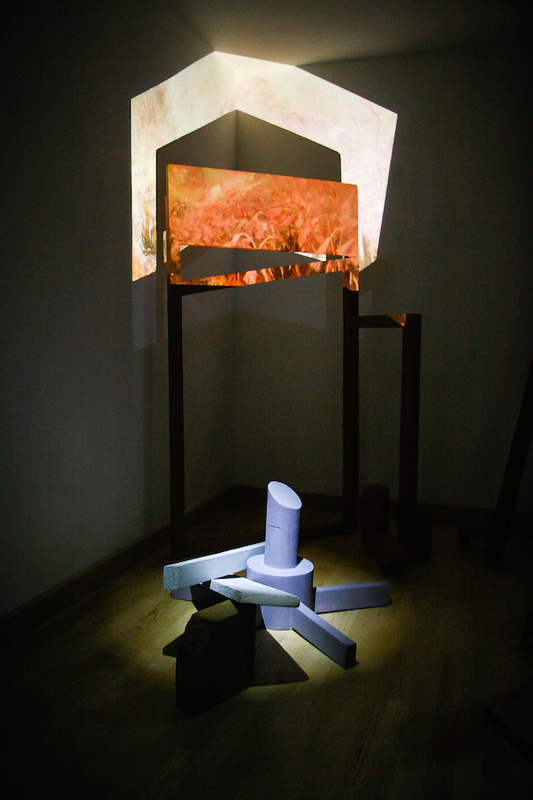 Unlike at the exhibition, in the aforementioned scene, the objects and bodies fall back to repose after levitating outside space and time. Máté Feles builds the ruins of a quasi-Wunderkrammer. 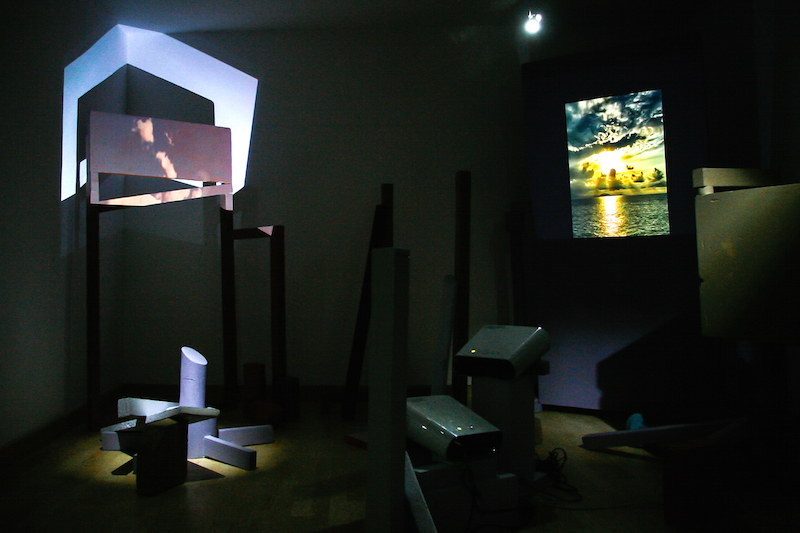 The elements of his installation – self-made fiber base and epoxy figures, objects reminding us of crumbling industrial items, office furniture, presentation tools, and the atmospheric pictures projected on these –interlock in a peculiar way: like the floating had ended prematurely, and as if the collision wasn’t softened by the slowed-down time. The abandoned, fractured and broken furniture hold the history of the space, the scene infers from these and it is to be projected to each individual, whether backwards or not, until the meaning finds its way back to completeness. In the movie of Tarkovsky, the female character having no memories (the being recreated by the planet Solaris) recalls and relives the memories of her husband by staring at the painting on the wall, thus objects become the channels of travelling between worlds. The stage-like arrangement of the room develops into a narrative environment by the memories evoked however, it’s only active until the thoughts of the characters – or the audience of the exhibition – keep it in motion. The exhibition is a space for presentation which arranges the pieces of an informative structure to disorder, the pieces of a structure which aims to help the presentation of other objects, images and texts. On the ruins of the functional setting, the objects looking for their places need the eye and the physical activity of the audience in order to figure their way back to their former roles. 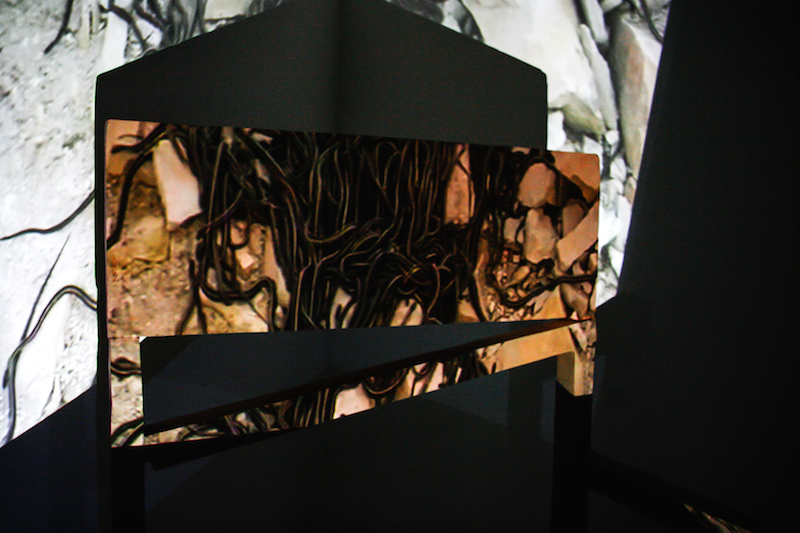 The pictures – still or motion, painted or filmed – are the survivors of the return which shook the space and tumbled down the installation, the treasures of the Wunderkammer, which create connection between the past and future states: they are the trustees and the transmitters of the story at the same time. Máté Feles (1984) lives and works in Berlin. He studied artistic film courses in Mark Leckey’s class at Städel Schule in Frankfurt, studied philosophy at Humboldt Univerity in Berlin and he was a guest student at Universität der Künste on the faculty of sculpture and media. 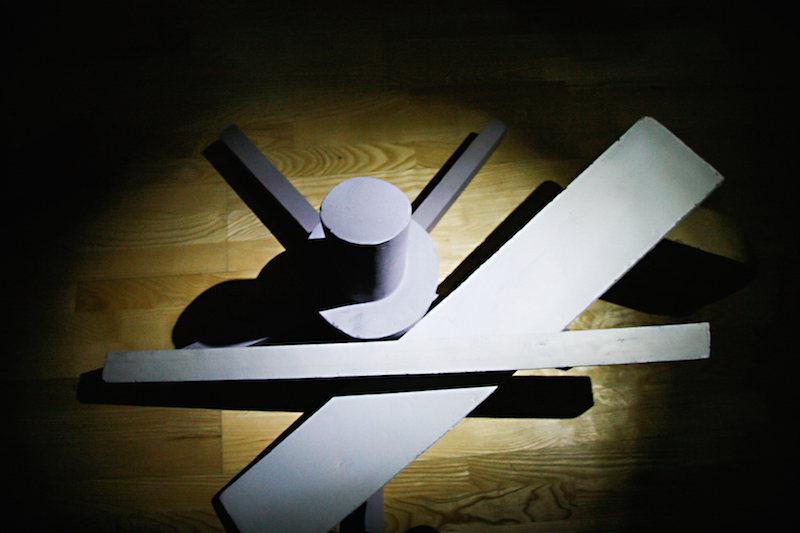 His artistic work is knowned by the diversity of mediums: his space-specific installations comprise the attributes of classic sculpture and modern techniques in the same time. He exhibited numbers of gorup shows: at Service Garage in Amsterdam (2012), at Collegium Hungaricum Berlin (2012) and at the Studio of Young Artists’ Association in Budapest (2010).